German Chancellor Merkel is one of the outstanding leaders of our era. She leads the world's fourth largest economy, which is still the locomotive for Europe. Recent state elections and polls leave little doubt that barring some kind of shock, she will be re-elected as Chancellor in September. It will be her fourth term. Macron is the youngest president in modern French history and has not held a public office until now. He is the fourth French president during Merkel's tenure. When Macron was born (1977), Angela Kasner married a physics student, Ulrich Merkel. They were divorced in 1982 as Macron was getting ready to attend school. Chancellor Merkel was raised in East Germany, though born in the West. When able to, she joined Germany's center-right party, the Christian Democrat Union (CDU). Macron comes out France's Socialist Party and was Economic Minister under Hollande, before breaking away to form his own party. Among his first acts as President, Macron named the Republican mayor and member of parliament, Philippe as Prime Minister. Reaching across to a Republican is a bold move, and suggests a dramatic change in the political landscape in France. Hollande's ineffective presidency did the Socialist Party much harm, and Macron's departure split the party. A political realignment cannot be limited to the center-left but has to involve the center-right. Next month's parliamentary election will be the first test if Macron has been successful in re-orienting French politics. The appointment of Philippe was not just a cynical move of electoral posturing, but also seems to reflect Macron who was part of what might be considered the business-wing of the Socialists or the realos faction, which is more interested in shaping France than adhering to an old dogma. Macron's agenda appears two-fold. The first is political reforms to raise the bar of ethics. He wants to ban the hiring of family members by government officials. This was Fillon's downfall. Fillon was the odds on favorite but was snared in a scandal of hiring family members from which he could not extricate himself. Macron ascendancy is a bit like UK Prime Minister May. Macron's electoral success required his adversary Fillon to shoot himself in the foot. May too benefited when the other claims on Tory leaderships faltered at their own doing. Unlike May, though, Macron's ambition was clear before Fillon's scandal. The inability of the French left to unite behind a single candidate also made possible Macron's victory. Second, and ultimately, Maron's success will depend on his ability to revive the French economy. The French economy has been a lagged for several years. The unemployment rate is near 10%, more than twice the UK and US rate. The German unemployment rate is below 6%, and the lowest since unification. Macron will likely emphasize labor market reforms and tax cuts. Europe was sometimes compared with an airplane and Germany, and France were the pilot and co-pilot. But Hollande's ineptitude and France's loss of competitiveness in recent years meant the co-pilot was missing. If France is to regain its place, it needs to get its economic house in order. That is the only way to be taken seriously in Berlin and Brussels. Europe requires a stronger France. Europe works best when there is a healthy tension between the creditors and debtors. Germany represents the interests of the creditors well. However, a strong voice for the debtors has been lost in recent years, allowing dangerous asymmetries to emerge. France needs to be strong to check the creditors and Germany. Otherwise, there is no French glove to house the German fist. The institutional check on creditors has come from the ECB, which arguably has filled the vacuum left by the weakening France. Recall many had expected then-Bundesbank President Weber to succeed Trichet at the helm of the ECB. Weber lost an early vote on the unorthodox monetary policy at the ECB and quit. That allowed Draghi to become the ECB President. The way Europe does things, it would most likely be a German turn when Draghi's term is up in 2019. It is important that another check on the creditors emerges as the ECB under German leadership cannot be counted on to provide the balance. France's leadership will be vital. Although EU sentiment has edged higher in most countries since the UK referendum last June, and the populist-nationalists have been turned back at every opportunity, the democratic deficit remains. European leadership is well aware of it challenges going forward. A new roadmap for Europe post-Brexit is needed, and France, more than Germany, may have the vision. Merkel may be a great statesman, but her vision comes, they say, from mountain climbing, where only the next foothold and handhold are important. 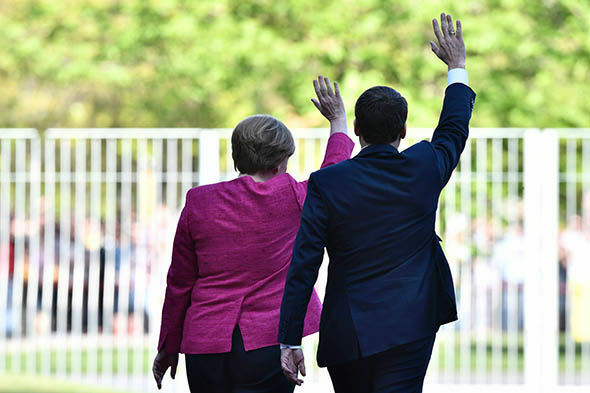 The June parliamentary elections in France will determine Macron's honeymoon, but the early signs are positive. Macron knows that reducing France's budget deficit and bringing it back to the Stability and Growth Pact requirements is a necessary precondition for being taken seriously on EU reform. It seems clear that deep reform will require treaty changes, but the sequencing is important and won't be lost on Macron.